Day 5 One of the unfortunate side effects of reading and blogging like rockstars seems to be a tendency toward burnout. How do you keep things fresh on your blog and in your reading? Avoiding burnout is something that we all have had to deal with at one time or another. There are lots of ways that I battle the urge to pack it all in. 1. Post about other things. Photography posts are my favorite way to throw up some interesting content that usually gets a lot of comments and makes me feel inspired again! 2. Reread a favorite that you can gush about. Sometimes I get in a summary-thoughts format rut. When I start talking about a favorite, I find that it's impossible to stick with a formula. 3. Participate in an event. This always helps to rekindle excitement about the blog and also to give fresh ideas, either through conversations with others or through visiting their blogs and seeing something cool that someone else is doing. 4. Be forgiving. If you're not feeling the blog at the moment, take a break. It's not like we're required to either be regularly active or else we have to quit. Take a break and if the blog is something you truly care about, you'll miss it and find your way back. 5. Don't apologize when you get back. I think that the need to apologize and explain sometimes delays one's return because those posts are tough to write and are ultimately negative. Unless it's a reason that you really feel the need to share, it's okay to just start back in with regular posts. How do you avoid or recover from burnout? This is the last day of Book Blogger Appreciation Week so I just wanted to thank Jenny, Andi, Ana, and Heather for bringing back this event. I was a little unsure at first but this has been an amazing week of meeting new friends, celebrating with old ones, and seeing just how important we are to each other. I love this community! Finally, I want to plug my upcoming book event one more time. 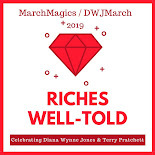 March Magics is a month-long celebration of the lives and stories of Diana Wynne Jones and Terry Pratchett. I announced the event here and will be posting dates for the readalongs and more next week. Join us if you are a fan or a newbie. Everyone is welcome! I've never read any DWJ. What book do you recommend for a newbie? Howl's Moving Castle is always a good place to start! Definitely agree about not needing to apologize for being gone/taking a blogging break! Sometimes it seems like it doesn't even need to be mentioned - we all understand! Exactly. No one will judge for a break because we all need them at one time or another! Excellent point about taking a step back - it sounds counter-intuitive but I think it really has the potential to let you remember the enjoyment factor. And some bloggers really do hit that point when they are done. But, for many of us, a brief break helps us remember the things we would miss if we fully quit. Love the advice about not writing apologies. I think I'm bad about that and you're right, it does make it difficult to return. I've had to come to terms with the idea that a 2 day or 2 week or even 2 month break is ok sometimes. I've found that if I announce that I wont' be blogging much, I never feel any reason to apologize when I return. That's helped me a lot. Good point. We usually know the point when we're not feeling the blogging mojo. Yes! We apologise way too much, myself included! We have this self induced guilt, because nobody is actually making us feel bad about stepping back and taking a break, except ourselves. Exactly! Nobody has ever come to my blog after a break and chastised me for being gone. So why do we do it to ourselves? This, of course, applies to life too! Oh man, the re-read is SUCH a great way to get back in the swing of things and out of the summary rut. 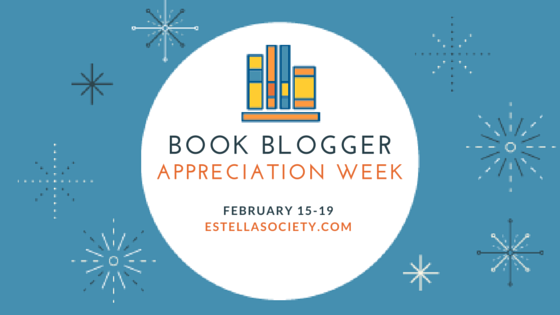 I did the Potter Binge with the Estella Society and just wrote bullet points of my thoughts and it was amazing and fun. I'm thinking of doing it again, this time with Alice in Wonderland. Alice is one of my all time favorites and it's so complex that you can find something new and fun to say about it every time! Plus, mome raths. Events and re-reading favorites are both great ways to get out of a rut! And oh, the guilt. I keep trying (and failing) to shake it off, but it's getting better. Guilt never makes for good posting! Maybe this is a nice reminder to share with each other regularly: "No Guilt!" I think I'd let myself forget how much participating in a blogging event can rejuvenate my feelings about the whole process. This week has been awesome, and I'm extra-excited for March Magics now! I know. Events are fun and we don't have them often enough! I think forgiving oneself is good advice. I would even so far as not feel guilty when you can't meet your own expectations. But I know that's easier said than done. I'm so glad to see BBAW revived. I've enjoyed visiting new-to-me blogs and reconnecting with old friends. I'm glad to know you! It's good that you have hubby as a voice of reason. :) We all definitely need to be more forgiving and less apologetic for things that are out of our control or that have no blame attached. I'm definitely planning to join in on March Magic! (I first typed March Madness and I don't even watch basketball). I'd love to read more by Pratchett and discover the awesomeness of Jones that I keep hearing about. Fantastic! I think my post will be up next Tuesday with dates and prompts and such. I agree with you on apologies, but I guess it is human tendency to explain. Having said that, an explanation is not necessary, and getting back into the swing of things is all that is required (if and when one feels up to it, that is). I love the not apologizing when you come back statement. I never thought about that. And I think I'll implement it. Thanks so much!! I agree about not apologizing/explaining when you get back. Other bloggers understand stuff happens, and non-regular readers don't care. Yup. We put so much extra pressure on ourselves. Silliness! Participate in an event is a great one! BBAW got me to blog AND talk to people on Twitter. Win, win!